i recently visited his kever. it was uniquely bare of all plants in a sharply deliniated Tzuras HaKever. this is different from all the kevarim which had some grass or something growing on the mokom. it was as if it was a fresh grave. very strange. ????”? It is very common for Rabbanim not to have any trees, plants or flowers, because many halachic authorities forbid it. Upcoming Yartzeit: 28th of Av, Tuesday August 18th. 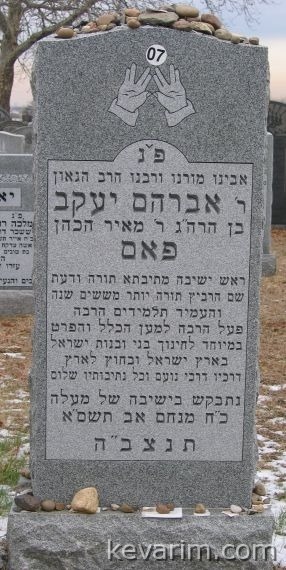 Rav Pam’s father’s name is Meir Zanvil, as stated on his kever. But on Rav Pam’s kever, the Zanvil is missing. Any reason for this? Apparently, this issue was already dealt with.